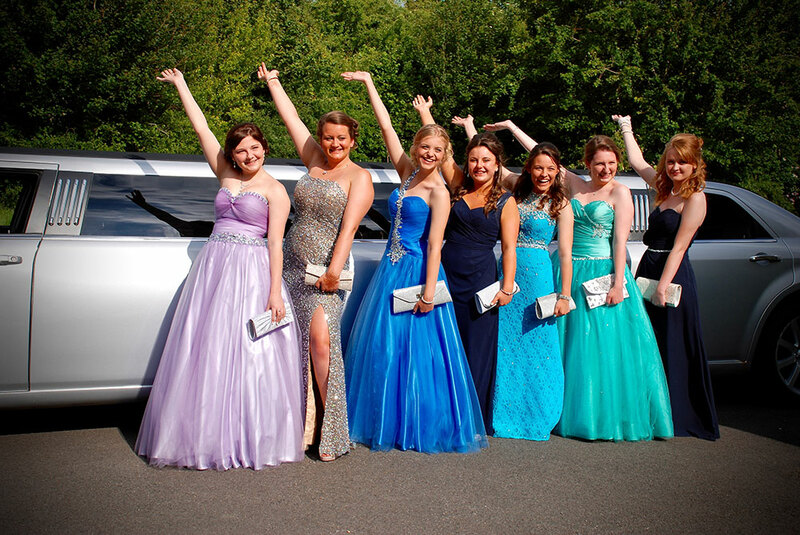 If you’re looking for first class travel for School Proms, Leavers Balls in Reading Berkshire and , then 1st Class limos caters for all! 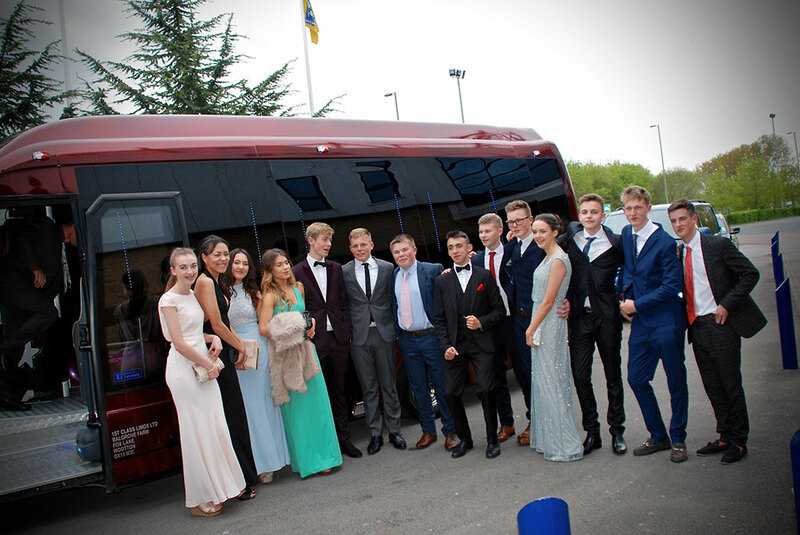 Our Stretched Limousines are extremely popular for School leavers Proms, whether you are a small or large group of up to 16 passengers we have a Prom car available for you to rent to suit your transport needs in Reading Berkshire. Your School Prom is the end of an era and a big date for school leavers, so you want it to be a night to remember! It’s important to arrive in style to your special event whilst turning heads along the way. 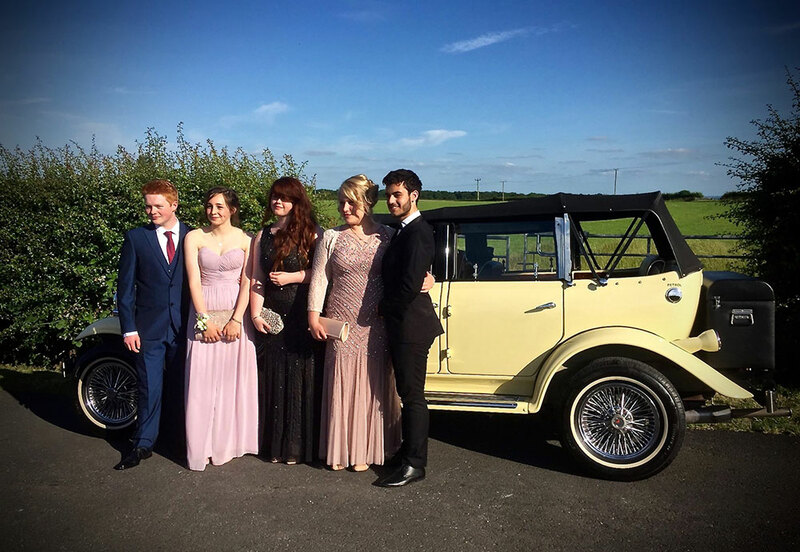 At 1st class limousines we have a wide range of stretched rental vehicles to offer you; if you want charm and elegance then why not hire one of our 1920’s-1930’s style vintage cars? 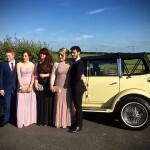 These vintage cars look astounding on arrival and not forgetting in your Prom photograph! We can even seat up to 7 passengers in our Bramwith stretched vintage car consisting of a glossy black and ivory exterior and cream and burgundy leather interior. For class and sophistication, then why not hire one of our 8-seat limousines in Reading Berkshire, ranging from our vanilla white Chrysler to our silver Chrysler also known as the Baby Bentley or even our classic white Lincoln town car? 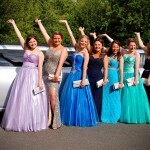 Any of these vehicles could be the perfect car for you and your friends to hire for you leavers ball! All of our limos are fitted with new interiors and mood lighting throughout for that luxury feel that everybody desires. If your party consists of more than 8 passengers, then one of our stretched hummer limousines is the right choice for you, seating up to 16 passengers! 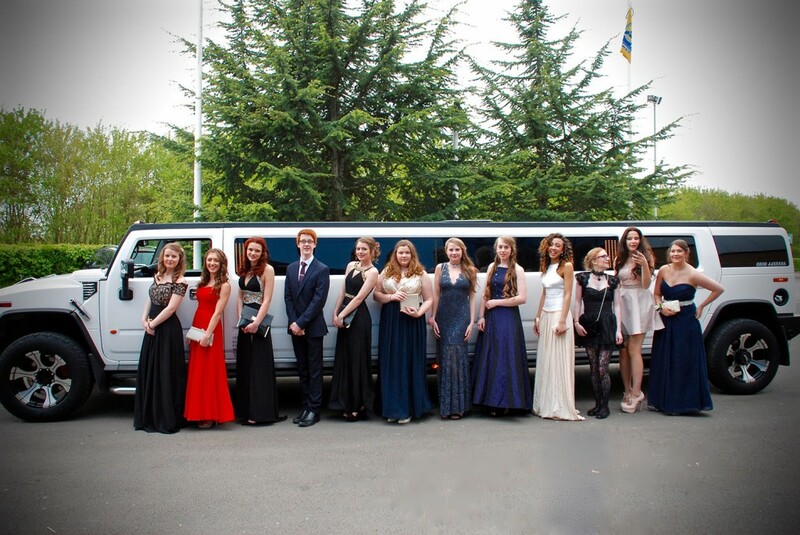 Our 15 seat white hummer is the perfect choice for mixed groups, offering a classy interior of gold and white, whereas our 16 seat pink Hummer is mostly popular with groups of girls as well as mixed groups in Reading Berkshire! Both boast amazing lighting displays throughout the car with our disco floor and ceilings. 1st class limos in Reading Berkshire also own the Hummer of all Hummers with our 8-wheel, silver, triple axle, being the one and only largest limousine in the whole of the UK! This 16-seater is a must for those wanting to turn heads at Prom knowing that they are the only ones to be travelling in this exclusive beast! This interior also boasts a lighting display like nothing you’ve ever seen before, from the lasers to the disco floors, ceilings and bars, there’s even a whopping 10KW audio sound system that has Bluetooth connectivity! We also own a 16 seat Party Limo Bus which is ideal for mixed groups wanting the whole package; this car has amazing lighting displays with an added feature of karaoke on board with over 2000 songs to get the atmosphere buzzing. All of our Limousines and Hummers have new interiors, exceptional, top of the range sound systems, champagne bars, mood lighting throughout and even television screens to watch the latest music videos. Let us be part of your special day and bring some fun along the way with 1st class limousines in Reading Berkshire. Parents can rest assured that all of our drivers are CRB checked; vehicles are all maintained to the highest standard and licensed with VOSA. We hope to give parents that peace of mind when booking on behalf of the group by talking you through any worries. 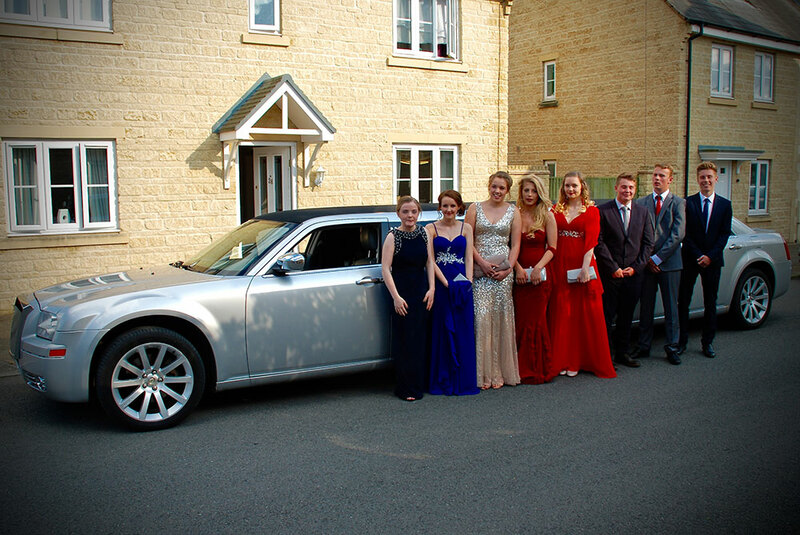 Why spend all that time and money to look first class for your school prom if you’re not going to arrive like a VIP with 1st Class Limos Reading Berkshire? We offer one-way trips for those that are local or return trips for those who may be further afield and need to safely return home. So, fill out our online quote form today for prices and availability, remember we book up fast so don’t leave it until the last minute! A small deposit is all that is required to reserve your limousine, so call the office today so secure your booking!